which a very vulnerable group of organisms have to deal with. of which their ecological habitats become endangered. During the end of 2011 the first figure within this project was completed (Trooper Toad) after a commission to the great custom painter PlasticPlayhouse. Since I was so impressed by the skills he showed there I decided to ask him to paint up 7 more figures from the Battle Beasts line (all in damaged condition) and not just 7 random ones but those who were reptiles and amphibians since at that moment the idea of a team of reptile and amphibian Battle Beasts was already born. With these figures in progress there was some time to think over the ‘philosophy’ behind this project and the message this project is supposed to spread. 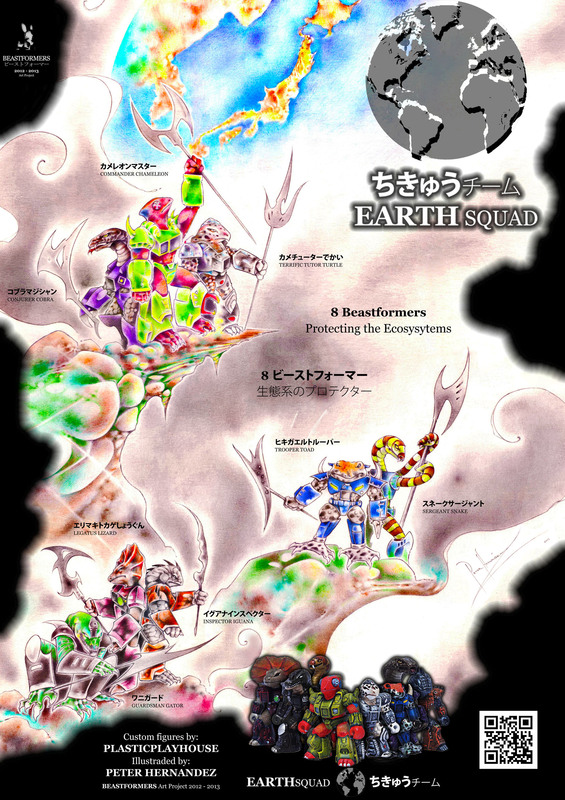 At that moment the Earth Squad idea was born but instead of addressing a continent to a certain figure or to work with the original idea of water, sea, wood, land, fire, air the connection of balance on Earth was better represented by the ecosystems in which each of these figures live. So every single one of them was supposed to become a representative protecting its own ecosystem and to contribute to the team with its own special feature and or knowlegde so that the team as a whole would be in balance itself as well. With these thoughts the great Illustrater Peter Hernandez was challenged to make an illustration for the poster representing the figures painted by PlasticPlayhouse showing them all together in a mystical landscape, on another planet, watching over the globe. This sketch was a long running project as well since he was asked to draw it on an A3 size paper and in full color so that the actuall figures could be recognized as such not only by shape and looks but also by their colors. All together this project resulted not only in a piece of great artistic coherence but it also makes a statement with the message it represents because in the end these are indeed vulnarable organisms which deserve to be protected to save them and to restore the balance on Earth! Project Idea: A project with the Reptiles and Amphibians from the vintage Battle Beasts line. Conclusion: One of the best and most challenging projects done so far by the Beastformers team but in the end its been more than worth it since it has resulted in 8 awesome custom figures which are proudly added to the collection together with the great artwork and storyline that is connected to them.